After a fabulous personal and professional experience, we opted for a second sponsorship. We joined JRR in Charlotte at the Charlotte Motor Speedway for the NASCAR Nationwide “Dollar General 300” on October 16, 2009. 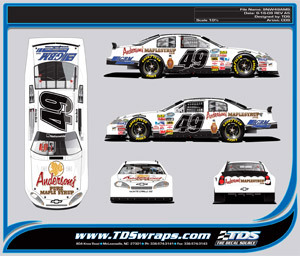 At this race Anderson’s also appeared as a secondary sponsor on the no. 28 Border Patrol car driven by Kenny Wallace. We were happy to include our close friends, Brian and Jamie Wickstrom and Bill and Kelly Anderson on this trip. They are the reason we first became interested in sponsoring a NASCAR. We had planning to go to a race and then realized the marketing power we could harness by sponsoring a car, not to mention the great perks of watching the race from the pit area. Once again the #28 car lived up to its record with a great race and a very respectable 21st place finish. The Anderson’s Maple Syrup Chevrolet driven by Mark Green qualified in 15th with his usual speed.